A number of progressive Sikhs, particularly among the diaspora2, are hopeful that Gurbakhsh Singh Kala Afghana's excommunication, announced by the Akal Takht (the supreme Sikh temporal authority, analogous to the Vatican) one year ago today, will spark a similar reform campaign within Sikhism. Kala Afghana has devoted the past twenty (or so) years of his life, since retiring from Punjab's police force, to dispelling the ritual and mythology that has gradually contaminated Sikhism over the years since its pristine birth in 1469. He believes Sikhism, like Buddhism and Jainism, would have been absorbed into Hinduism were it not for the unambiguous and consistent delineation of Sikh theology provided by Sikhism's primary scripture, the Adi Granth. 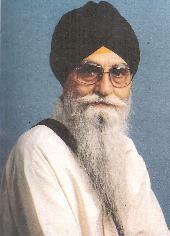 In an interview with The Sikh Times, Kala Afghana stated that his only rahit maryaada (code of conduct) is the Adi Granth. He confirmed that he doesn't believe in the official Sikh Rahit Maryaada, approved by the Shiromani Gurdwara Parbandhak Committee (S.G.P.C. ), an elected body responsible for managing India's major gurdwaras. His most influential work is the multi-volume epic titled Biparan Kii Riit Ton Sach Daa Maarag (From the Practice of Ritual to the Path of Truth). The series expounds in great detail on the astonishing number of rituals and mythologies that have gained currency in contemporary Sikhism. This essay highlights the primary themes. The fifth volume in the series lays out the Vancouver-based author's controversial views on amrit (sweetened baptismal initiation water). Although twice-baptized3 himself and a strict observer of the amrit-dhari (orthodox) form required of baptized Sikhs, he raises several compelling questions regarding the origin and state of amrit sanskaar, Sikhism's institution for initiation into the orthodox4, 5 Khalsa order. When Sikhism's tenth Guru (preceptor), Gobind Singh, announced an end to the line of personal human Gurus, he awarded Guru status jointly to the Adi Granth (or Guru Granth, a book of spiritual hymns) and the Guru Panth (the collective will of the Sikh community). Therefore, Kala Afghana contends that only the hymns contained within the Adi Granth ought to be read during the baptism ceremony. In it's current state, however, the initiation ceremony consists of the reading of five hymns, of which three (Jaap, Ten Savaiyaas, and Benatii Chaupaii) are from the Dasam Granth and only two (Jap and Anand) are from the Adi Granth.6 The Dasam Granth is a body of work of disputed authorship, traditionally attributed, in whole or part, to Guru Gobind Singh. Traditionalists claim that Guru Gobind Singh read from the Dasam Granth during the pioneering baptism ceremony performed during the 1699 founding of the Khalsa. In rebutting such claims, Kala Afghana reasons that if Guru Gobind Singh wished to elevate the Dasam Granth to the position of Guru, he would have done so by including it into the Adi Granth. According to Kala Afghana, reading hymns from the Dasam Granth during the baptism ceremony is tantamount to according Guru status to the Dasam Granth. His challenge to the current incarnation of the institution of amrit sanskaar is rooted in a strict refusal to treat the Dasam Granth as sacred scripture. He insists that by not doing so explicitly, Guru Gobind Singh sought to draw a clear distinction between the two, a distinction that appears to be lost on those who insist on treating it as scripture. Kala Afghana also challenges the stockpile of mythologies surrounding the institution of amrit. He refutes as completely baseless, for example, the traditional mythological claims that amrit can revive the dead. Traditionalists claim that the amrit sarovar (pool of nectar) surrounding the Darbar Sahib (Golden Temple) in Amritsar, Punjab possesses the power to revive the dead. Kala Afghana contends that if this were true we would not have witnessed the numerous dead bodies floating in the pool at the conclusion of Operation Blue Star14 in 1984. It should be noted that although Kala Afghana has been writing since 1993, the Akal Takht did not move to ban him and his writings until after he unmasked the mythological and ritualistic content of the 1999 reissue of Gur-bilaas Chhevin Patshaahii, co-edited15 by the Akal Takht's jathedar (head priest), Joginder Singh Vedanti. The anonymously authored book, often 'attributed to a poet called Sohan,'16 is a 'hagiographic treatment'17 of the life of Sikhism's sixth Guru, Hargobind. It 'portrays Guru Hargobind as the twenty-fourth reincarnation [avatar] of [the Hindu god] Vishnu'18 and asserts that the Darbar Sahib's four entrances represent not egalitarianism but 'the four arms of Chatarbhuji (a Hindu god). '19 By October 2000, the objections originally voiced by Kala Afghana had gained sufficient momentum to compel the S.G.P.C. to ban20 its own publication. However, despite the withdrawal of the book, the rituals prescribed in it continue to be practiced at the Darbar Sahib, the holiest shrine of the Sikhs. These rituals include the nightly bathing in milk of the floor that provides the Adi Granth's daytime setting, keeping a ghee jyoti (oil lamp) lit at all times, and the provision of a cot and quilt for the Adi Granth at its nighttime resting place. In the above backdrop, Vedanti's action against Kala Afghana appears vengeful. Furthermore, it is an irresponsible abuse of power contributing to the lowering of the prestige of his august office. Karolides, Nicholas J., Margaret Bald and Dawn B. Sova, 100 Banned Books: Censorship Histories of World Literature (New York: Checkmark Books), pp. 228-229, 1999. The Sikh Bulletin (Roseville, CA). Interview with The Sikh Times, June 1, 2003. Singh, Khushwant, A History of the Sikhs, Volume 2 (New Delhi: Oxford University Press), pp. 293 and 320, 1999. McLeod, W. H., The Sikhs: History, Religion, and Society (New York: Columbia University Press), p. 53, 1989. McLeod, W. H., Sikhs of the Khalsa: A History of the Khalsa Rahit (New Delhi: Oxford University Press), p. 398, 2003. McLeod, W. H., Textual Sources for the Study of Sikhism (Chicago: The University of Chicago Press), p. 6, 1984. McLeod, Hew, Sikhism (Penguin Books), p. 177, 1997. Oberoi, Harjot, The Construction of Religious Boundaries: Culture, Identity and Diversity in the Sikh Tradition (New Delhi: Oxford University Press), p. 98, 1994. McLeod, W. H., The Sikhs, p. 135. Oberoi, Harjot, The Construction of Religious Boundaries, p. 99. McLeod, W. H., The Sikhs, p. 92. Singh, Khushwant, A History of the Sikhs, Volume 2, p. 129. Operation Blue Star was the code name given to the Indian army's offensive into the Darbar Sahib, aimed at the epicenter of the armed movement for Sikh autonomy in the Indian state of the Punjab. The other editor is Dr. Amarjit Singh, professor, Shaheed Sikh Missionary College, Amritsar, Punjab, India. Mcleod, W.H., Textual Sources for the Study of Sikhism, p. 12. Mcleod, W.H., Textual Sources for the Study of Sikhism, p. 161. Oberoi, Harjot, The Construction of Religious Boundaries, p. 102. Singh, Jasvinder, The Sikh Sentinel, July 11, 2003. The Tribune, May 11, 2003. The Tribune, August 3, 2003.